CNN talks with oil rig expert Bud Danenberger on the rig failure in the gulf and the potential for the oil spill. Click on link to see video. Another video follows. 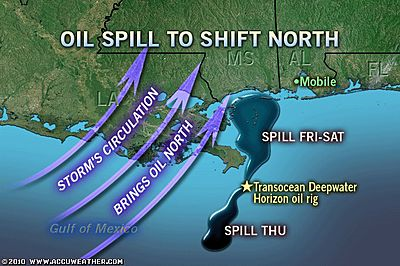 Choppy seas, strong winds and rain halted Saturday’s cleanup of an oil spill around the massive oil drilling rig that exploded and toppled into the ocean off the Louisiana coast. Eleven workers are still missing from the Deepwater Horizon rig that sank Thursday about 50 miles from Louisiana’s coast. They are presumed dead. The bad weather rolled in Friday, bringing with it strong wind, clouds and rain that interrupted efforts to contain the oil spill. Petty Officer Erik Swanson of the Coast Guard said cleanup would resume once the weather cleared. The cause of Tuesday’s massive blast off the Louisiana coast is unknown. On Friday, Coast Guard officials suspended the three-day search for the missing workers. An undetermined amount of oil has spilled from the rig, though Swanson said Saturday morning that remotely operated vehicles had not yet detected any leaking oil from the well or rig. However, crews are closely monitoring the rig and well for any more crude that might spill out. An oil sheen appeared to cover an area about two miles wide and eight miles long Friday afternoon. BP PLC, which leased the Deepwater Horizon, opposes what it says are "extensive prescriptive regulations." While crews race to contain the Gulf of Mexico oil spill, severe weather and a period of rough seas this weekend will threaten the area as a line of thunderstorms is forecast to move through the region.